Peterborough United chairman Darragh MacAnthony has given manager Darren Ferguson his unequivocal support after a dismal start to the season. They are rooted to foot of the table after losing all five games, including a 5-2 defeat at Burnley on Saturday. "If Darren were to leave, I'd do the same - I'd have failed. 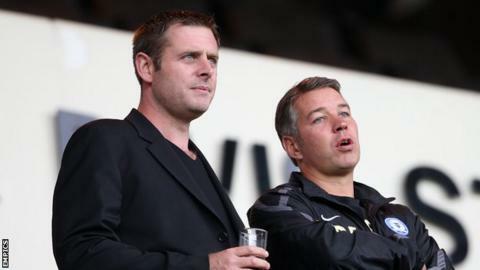 "Getting rid of the manager isn't the way to go, he's an amazing manager and he needs all our support," MacAnthony told BBC Radio Cambridgeshire. The loss at Burnley prompted him to use Twitter to say: "I'll have a serious think about my own position over weekend - and my own shortcomings/failings in helping the manager & playing squad this season. I only want what's best for them & Posh fans." It led to speculation that MacAnthony could walk away away from the club but he insisted it had never crossed his mind. "It wasn't from a position of 'oh, I'm going to walk off into the sunset', it was from a position of what more can I do as chairman of the football club? How can I help the manager more? Do I need to spend more time in the UK? Do I need to offer more financial support? "Everyone's got to look at their position once in a while, the players, the staff, the manager, me, to say what more can we do to improve our position as a football club," he explained. Meanwhile, Ferguson has urged his players to "stand up and fight" in order to start climbing the table. "It's not all doom and gloom - we're not happy but there's a positive feel that we can get out of it," he said. Peterborough have been plagued by injury problems over the summer and since the start of the season, but Ferguson blamed a lack of consistency for poor results so far. "Some individuals have shown they're more than capable at this level - and some are being very inconsistent, in particular in our defending," said the 40-year-old Scot, who is in his second spell in charge. Bottom of the Championship is not an unfamiliar position for Peterborough, having been relegated to League One in 2009-10 - a season in which Ferguson left the club by mutual consent and later took over as manager at Preston - but it is one which he wants to move away from as soon as possible. Posh face Bristol City on Tuesday and he said: "I think a lot of the outside stuff is very, very negative but that's understandable and it's up to us to change the mindset of everyone. "We have a responsibility to our own fans to change that and we've got to start by getting out there, getting among them and by playing far better football than we did on Saturday. "I've never shirked away from a challenge and I'm not going to start now. "It's a totally different sort of challenge - I quite enjoy it in a way because I feel confident in my players' ability and my own ability."